Ann Phillips, Mayor David N. Dinkins, Idilio Gracia Peña, and Commissioner Pauline Toole, April 5, 2018. A few days before the ceremony, Kenneth R. Cobb spoke with Mr. Gracia Peña about the early days of his career. Kenneth R. Cobb: I know that you came from Puerto Rico in 1960, and in 1964 you were hired by the Municipal Archives. How did that happen? Idilio Gracia Peña showing visitors early City records during an open house, June 7, 1991. Idilio Gracia Peña: I was born on December 28, 1939 in Arroyo, Puerto Rico. My mother was a homemaker and my father was a sharecropper. I arrived in New York City on August 20, 1960, to join my cousins living at 228 E. 112th Street, in Manhattan. I was studying engineering, with a scholarship, at the University of Puerto Rico, but needed more money, so I decided to move to New York City. Four months later, in November 1960, I enlisted in the United States Air Force. After three months of basic training I was deployed to the Sheppard Air Force base in Wichita Falls, Texas. I was assigned to work at the Base Library which had three branches—the main library, a hospital recreational library for patients, and a technical library for the airmen studying aircraft mechanics. I performed typical librarian duties—ordering books, providing reference service—and I became the Administrative Assistant to the Base librarian. KRC: Now it’s 1964 and you are back in New York City. IGP: I returned to New York City and began looking for a job. Although I did not have a Library degree, I did have some experience as a librarian. At that time the government of Puerto Rico had a “Migration Division” that helped Puerto Rican migrants find jobs and assimilate to the new environment. They provided me with a reference and a referral to the New York Public Library. The only opening they had was at the Municipal Archives and Records Center, which was then a branch of the NYPL. KRC: I read that James Katsaros had been Municipal Librarian Rebecca Rankin’s assistant for many years, and after she retired in 1952, he became the director of the Municipal Archives. Was he your first boss? KRC: I know that the fiscal crisis in the mid-1970s hit the Archives very hard and you were laid off. Idilio Gracia Peña on an excursion to Ellis Island, ca. 1990. IGP: In the spring of 1975, Professor Kenneth Jackson of Columbia University visited the Municipal Archives accompanied by five history graduate students. I took them on a tour of the Archives and explained my concerns about lack of resources and our future. A few days later, Dr. Jackson wrote a letter to Mayor Beame recommending my services be retained, based on my understanding of the value of the Archives. Although the Director at that time, Mr. Carlyle Bennett, appreciated Dr. Jackson’s efforts and tried to keep me on the job, their efforts did not work. As I said, my Civil Service title was laborer, and that was one of the titles targeted for lay-offs. In June, 1975, I received a letter saying that my position was being terminated. I was out for six months. During that time I was assisting an attorney with a court case in Newark, New Jersey. The attorney arranged for me to be interviewed by a Deputy Mayor in the City of Newark for a job in the Mayor’s Office. On the day of my interview appointment, I received a notice to come to the Municipal Archives office—they wanted me back. I told them I would, but only on the condition that I be officially appointed Director. By then [January 1976], Eugene Bockman, Municipal Librarian, said I would be called “Archivist-in-Charge,” and after six months I would be appointed Director of the Municipal Archives. And they also gave me a new Civil Service title, “Administrative Archivist.” I think I’m probably the only person who went from Laborer to Director in one step. KRC: Yes, I think that’s probably true. David N. Dinkins with Idilio Gracia Peña in a Municipal Archives storeroom, 1984. At this time Dinkins was City Clerk. Idilio re-joined the Municipal Archives shortly before the City Council passed the legislation (Local Law 49 of 1977) establishing the Department of Records & Information Services (DORIS) as a mayoral agency, joining together the Municipal Library, Municipal Archives and Municipal Records Management divisions. As Director, Idilio transformed the Archives from a warehouse operation to a modern, nationally-recognized research institution, one of the largest in North America, providing access to world-class archival collections. He planned and supervised extensive renovations for the Archives’ new home in 31 Chambers Street to accommodate climate-controlled storage, conservation and micrographics laboratories, and a welcoming public reference room. KRC: You brought into the Archives some of our most important and iconic collections like the 8,000 original architectural records of the Brooklyn Bridge, and 1,500 drawings of Central Park. But I remember you said sometimes you had to act pretty fast. Among the collections accessioned during Idilio's tenure are the magnificent Central Park design plans. IGP: Yes, after we transferred the Brooklyn Bridge drawings to the Archives I discovered that 41 of the most important and valuable drawings were on a so-called “permanent loan” to the Whitney Museum. I called the professor who had borrowed them for the Whitney, introduced myself, and demanded their return to the Archives. He stated that the drawings were museum-quality artifacts and belonged at the Whitney. I said—“… both you and I know that that they belong to the Archives.” He replied “come and get them.” So I did. Another of my favorite rescues were two original Jamaica Town Clerk ledgers. They dated back to the 1780s and were being sold by a midtown book collector. They had been listed as “missing” in the original “Old Town” inventory of records transferred by the towns and villages to the Comptroller after Consolidation in 1898. This time, I enlisted the assistance of the agency’s Inspector General to retrieve these valuable local government records. After a cursory inspection, I determined that they were the “missing” ledgers and demanded that they be returned to the Archives. The Inspector General gave the book collector two days to consult with his lawyer, before filing a formal court procedure to recover the books under the replevin procedures of Local Law 49 of 1977. Three days later the books were returned to the Archives. In another instance, I received a frantic call from a Department of Sanitation employee requesting that I stop by the garbage collection area of the Municipal Building. He said historical records were being dumped by a city agency. I hopped into the agency station wagon, put the records in the back, and drove them to the Archives. This was not an isolated event, many times right-minded city workers contacted me to ensure that city records were not improperly destroyed. Idilio Gracia Peña Commissioner of the Department of Records and Information Services, 1990-1995. 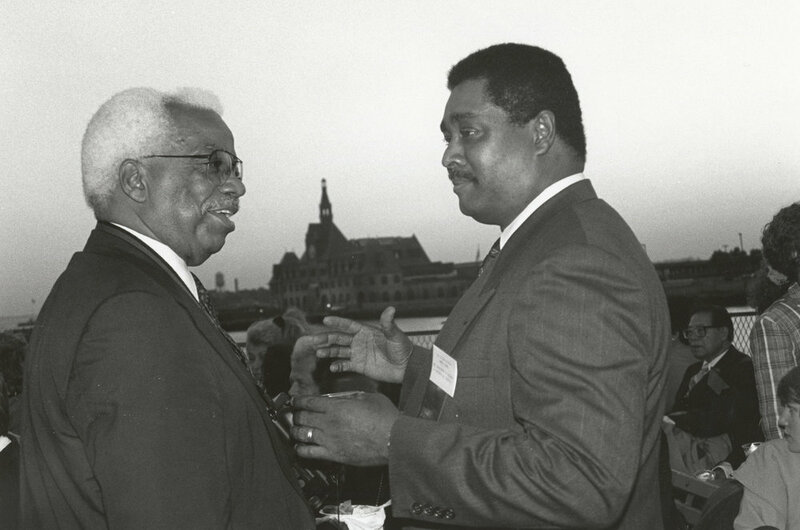 In recognition of his achievements, knowledge, and reputation in the archival profession, on January 1, 1990, Mayor Dinkins appointed Idilio Gracia Peña as Commissioner of DORIS. Among Idilio’s notable achievements were persuading the New York State Archives to dedicate $1 million annually from the Local Government Records Management Improvement Fund for to improve City agencies records management. He advanced innovative outreach programs including an exhibition highlighting the Archives’ holdings related to the newly-discovered African Burial Ground. Upon his retirement in 1995, Idilio continued his service to New York City through his pioneering work documenting the Caribbean diaspora. From 1997 to 2004, he served as project archivist for the Center for Puerto Rican Studies Archives of the Puerto Rican Migration at Hunter College, City University of New York. Since 2004 he has been the Chief Archivist of the Dominican Archives at the City University of New York. With Mayor de Blasio’s recent appointment of Idilio to the Archives, Reference and Research Advisory Board, the agency will more directly benefit from his vast knowledge and expertise.